My mom began one of my favorite family traditions about 14 years ago. One Saturday afternoon in March, we all gather together at her house to enjoy what she’s dubbed the “Green Dinner”. To celebrate St. Patrick’s Day, everyone wears green clothes and eat corned beef, shepherd’s pie, and turnips. The house is decorated and we all get Irish party favors. The kicker is that my sister and I contribute some green food or recipe to the meal. And yet after so many years, it can be a little tricky to come up with a new recipe. It requires some research these days. But in the spirit of St. Patrick’s Day and our upcoming Green Dinner, I’m taking a break from looking for a new green recipe and sharing a traditional good luck charm this week with quilling paper horseshoes! 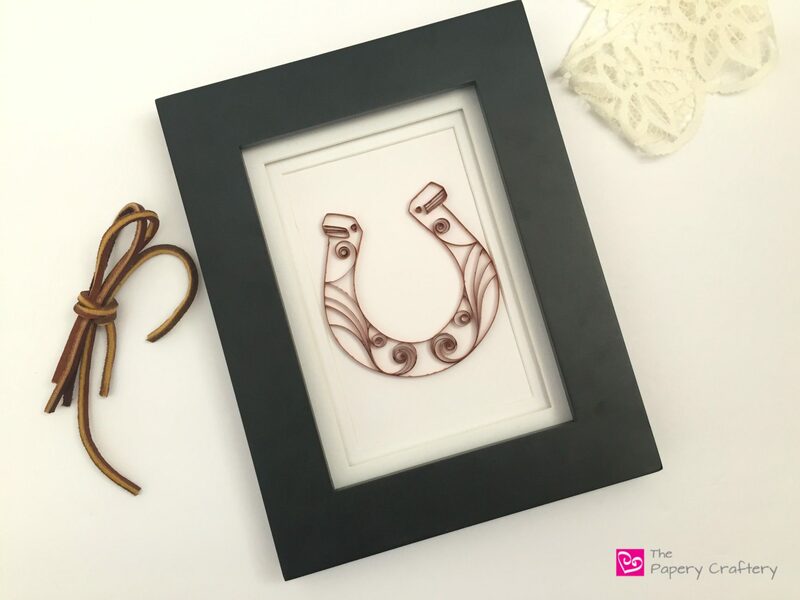 In addition to being a fun lucky trinket, these quilling paper horseshoes are a great practice in some quilling fundamentals! You can work on edge work, swirls and symmetry with these. Plus, working with metallic paper, which can be a bit tricky! First up, grab the template I made for this project. There’s not much to it ~ I didn’t even pretty it up with an illustration program. It’s just a basic outline because the real beauty of this craft is what you make of it. Once you have your template, pin it to your workboard under a wax paper sheet. Choose any quilling paper you’d like for your horseshoe and make double-thick strips for the edges. You’ll need about 24 total inches for the outline of one horseshoe. The paper I used for this demo is the copper from Paplin. In my eyes, it’s the perfect metallic brown and I use it for loads of crafts. You’ll also need your quilling tool, glue, lots of pins, and a pair of small scissors. Using small dots of glue on the outline, pin the double strips in place to form the edge of your horseshoe. For a recap on this, check out this post on the quilling paper mittens I made a few weeks back. Remove the pins once the edge is set. Be aware that one of the points of this craft is to make each side of the horseshoe a mirror image of the other. That means the left side will be the same as the right but flipped at the center. To make this easier, I drew a faint dotted line down the middle of my template. I didn’t make this on the final copy in case it wasn’t wanted by everyone. But I would recommend taking a second and doing so! Once your edge work is done, think about how you want to fill in your quilling paper horseshoes. There are infinite possibilities, but I like the idea of using swirls to add a soft, filigree effect. If you need some tips on making quilling paper swirls, check out this post. I think 4 strips is the magic number for making swirls for this project. Enough strips to give a nice effect, but still being easy to work with. I made these swirls just big enough to sit comfortably inside the edges of the horseshoe and left the ends open to play with them later. Since I wanted two swirls coming out from the center of my horseshoe, I needed to make them approximately the same size. My trick for making similar swirls is to line them up on top of each other. This helps me see how close they are in size. These two are not exact, but close enough for me! While your swirls are setting, work on another part of your horseshoe. There should be a small amount of those thicker strips leftover from the outline. Use them to add some dimension to your horseshoe by filling in thin, flat sections towards the top. I measured two straight lines and glued them in place. When working on the first side of your horseshoe, don’t worry too much about measuring anything. Just experiment and have fun laying out the swirls and strips until you achieve the look you like. The tricky part is matching up the other side. Place your second swirl on the other side of the horseshoe. Remember to take a moment and try to match it to the first side as much as you can. I like to use pins to rest the strips against while I work on getting them exactly where I like them. Once you’re satisfied with the placement of your paper, snip the excess with your scissors. Try snipping a tiny bit less than you think. It’s easier to make another cut than to have to make all new swirls because they’re too short now! Use a dab of glue to secure the ends of the strips. Don’t forget to glue any spot where the swirl meets the edge, too! There’s also a tiny spot on each end of the quilling paper horseshoe template. To fill this in, roll a 1″ strip of quilling paper and shape into a mini triangle. This detail, combined with the straight lines that were added earlier and the negative space at the top really help this design look like it’s coming right at you! Use a few scrolls to add some extra pizzazz to your design. Once all your components are dry, remove your quilling paper horseshoe carefully from your waxed paper. I played around with a few arrangements, but they’re all based on the same steps. Try different metallic paper, too. I keep coming back to that copper paper, though! I’ve mounted mine to be framed. Wouldn’t they be perfect in a rustic farmhouse? Or try one on a St. Patrick’s Day card, maybe. However you use your quilling paper horseshoes, enjoy the process and I hope these bring you a little good luck, too! Great, Bronwyn! Quilling works really well with horseshoes, I think!